FAMILY AND CHURCH are the two pillars of life in Tonga, and what could be better than that? Work and Play, Career and Travel, Power and Glory, the Haves and the Have Mores? There's really no contest in my mind. The Tongans have it right, and they have been at it for 3,000+ years so I trust their wisdom on this score. Here at the left is the King of Tonga, Tupou VI with his family at church. I have often heard others from outside of Tonga decry the supposed travesty of the missionaries influence, usually right after I describe the Tongans modesty. "Oh my, that's too bad they don't all run around nearly naked anymore?" It's too bad for whom, I ask you? It's really too bad for the papalangi visitors who would like for Polynesia to comform to the mythical fantasy they bring with them to the Pacific. Contrast this with the rather unreal places like those in Tahiti, where the super wealthy rent vacation bungalows at the daily rate that exceeds the monthly income of it's workers. There one finds the young hula girls performing a characterization of the fantasy. Tonga is a real place with really nice people who actually live, worship and play here. So if I have burst your bubble on that 'noble savage fantasy' it needed to go anyway. Papalangi is a word I hear a lot, or rather it's common abbreviation 'Palangi'. That's what they call me. Papa means to cut or to break and langi means sky. The first white skinned visitors were Schoten & LeMare and Able Tasman in the 17th century. Their ships coming over the horizon "broke the sky" and thus the new word. Most of the time when I am at a Tongan gathering, I am the only white person there and you get accustomed to it. Mostly they don't mean it as an insult, they are just not accustomed to having me around. The sight of a white skinned person on any of the islands outside of the capitol or the yacht harbor in Vava'u is unusual most of the time and so they are understandably surprised. But there is the other side of this name calling. Especially among the youth the use of Palangi is clearly racist, the same as when Hawaiians called me Haole. Sadly it goes farther than just wayward youth, as sometimes at teachers' meetings my colleagues don't refer to me by name but by my 'racial category'. But on the street when children point and say Palangi, they are surprised. Sometimes a tourist will fail to grasp this, and even to feel singled out unfairly. I have even seen European tourists racing through town on bicycles, nearly running over pedestrians in an effort to avoid contact with Tongans. That is really sad because the Tongans have a lot to share, given the chance. 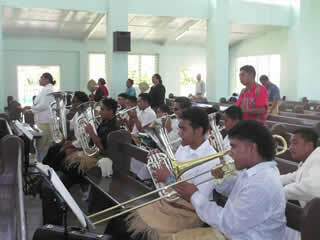 Music is a big part of why I love Tonga. 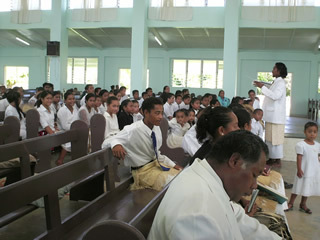 The best places to hear singing are at two of the most traditional activities in Tongan life; in church and at kava parties. Anyone can go to church and hear the music. I am usually at the Free Wesleyan church that is close to my school, associated with it, and where the students go. The students performed "Worthy Is the Lamb" by Handel at the church recently, about 140 singing and 12 brass players, but the church has their own children's choir (pictured here), a men's choir, a women's choir, they sing together most often as a combined choir, and they have a church band too. I go to other churches sometimes. 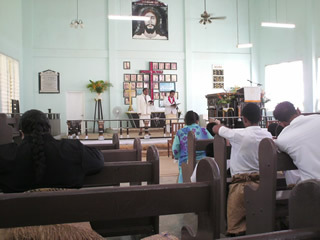 There are other Methodist sects; the Free Church of Tonga, the Church of the Chiefs, and the Church of Tonga where they sing the 'hiva usu' (Tongan composed hymns). Their choirs often have many small girls singing at high decibels. There are also Catholic and Seventh Day churches, and the Mormons are here too. This church just bought new instruments not too long ago, are'nt they nice, with everyone in their Easter white uniforms? Kava is an important social and ceremonial part of Tongan life. It has a double-sided nature. At night you can find many kava parties, especially on Fridays. But sometimes, men will have a little too much kava, making them 'kona' (tipsy). Some men will imbibe in this manner a little too often, say perhaps every night from 5pm until dawn for example. At this point the use of kava takes on a seemy negative character. The positive side is the more common one. Before special church services all the elders and ministers will always have kava. They will have a kava party associated with just about anything, really. Kava has no alcohol, it is a very mild depressant drug. Kava is made from the powdered roots of a pepper plant. The rest of the plant is not used, and there are no peppers either. Attending a kava party means sitting cross-legged and drinking lots of mostly water for several hours, interspersed with singing and talking. They really like to eat candy and unfortunately smoke cigarettes, but if you want to experience the singing it's a small price to pay. A good place to find a kava party is at the fire station and kava, candy or cigarettes make nice gifts to bring. The traditional dress for men in Tonga is the wraparound skirt that extends below the knee but above the ankle, called a tupenu, over which is a shorter woven wrap called a ta'ovala. The women wear dresses and over that is a woven kiekie wrap, similar to the ta'ovala only more ornamental like a beaded curtain. When a member of the family has died, they will wear larger ta'ovala over black clothes, but the Tongans prefer black clothing in general, especially the teachers (faiako) and preachers (faifekau), some who wear long frock coats especially within the Church of Tonga. The women will swim fully clothed, and the sight of a bikini would be positively scandalous. Women's bathing suits are worn only at beaches provided for tourist resorts, such as at Pangaimotu island in Nuku'alofa (the capitol). At schools the kids all wear uniforms, the color of which is predetermined by the denomination: dark blue is Wesleyan, light blue is Catholic, orange is Church of Tonga, green is Mormon, red is Seventh Day, and dark red is the government schools. The government high schools are exclusive, taking the highest scoring students. But the government primary schools (GPS) are provided for those who can't afford a church school, and are the lowest quality schools.